Deposit of $600 to hold reservation. 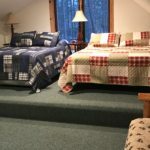 Welcome to Lakeside Pines on Pickerel Lake. 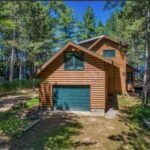 If you’re looking for the ideal vacation home with a great view, level frontage and close to the water’s edge, Lakeside Pines is the cabin for you. 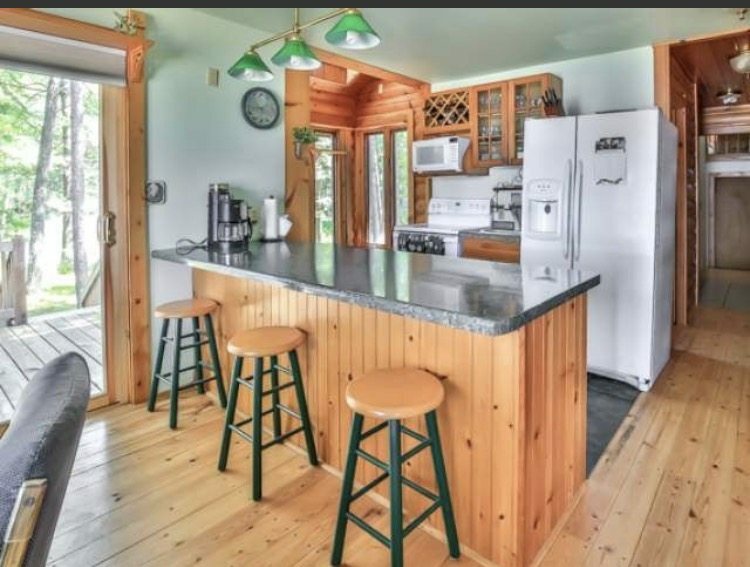 This splendidly decorated 4 bedroom 2 bath year round home with 255 feet of frontage is nestled in the heart of the Northwoods on beautiful Pickerel Lake just 5 minutes southwest of St. Germain. Whether it be great fishing, recreational boating, kayaking, canoeing or swimming, you can find this on the 740 acres of Pickerel Lake. 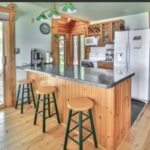 Enjoy the relaxation and privacy of this lake-front home, while having the convenience of being close to town with great dining, shopping, and fun-filled activities. 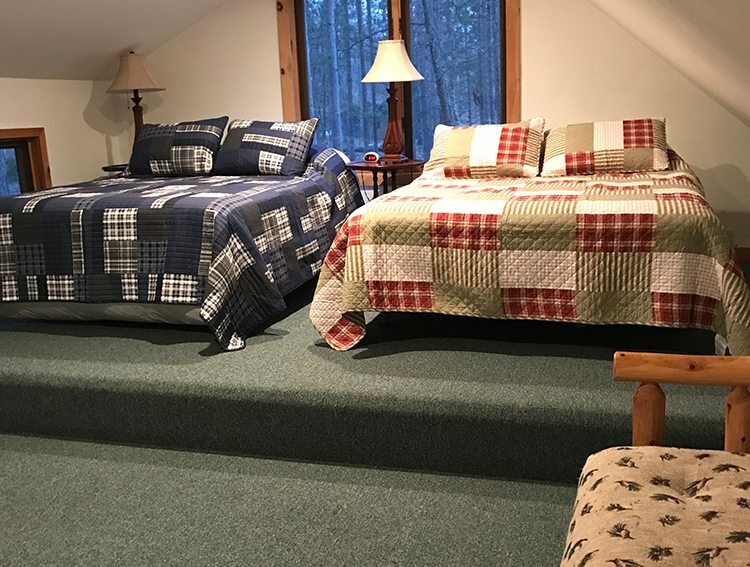 The main level of Lakeside Pines consists of living area, dining room, kitchen, queen bedroom, bathroom and laundry room. 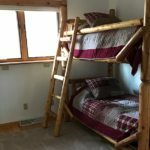 one bedroom with a queen bed, a bathroom, as well as a full kitchen and dining area. The living room serves as the perfect place to relax while enjoying the lake view. Meanwhile, the 50” smart TV will keep you occupied on rainy days. 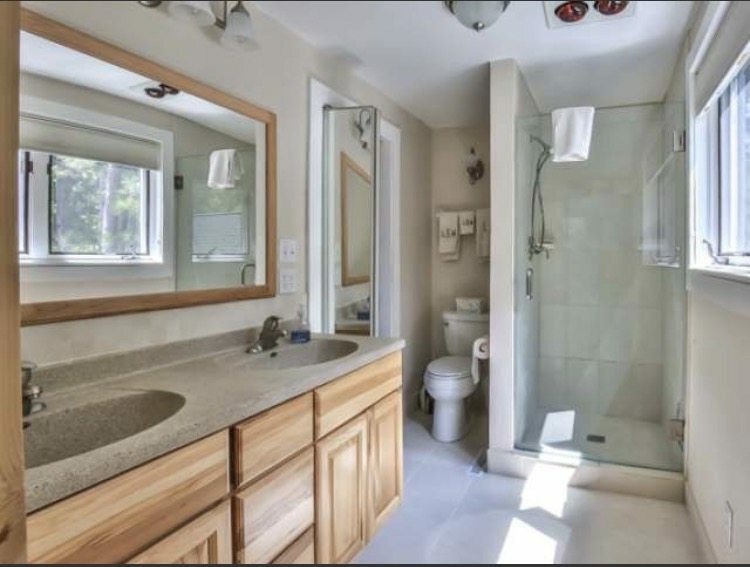 The upper level of the home has a large bedroom with a walkout balcony that overlooks the lake. 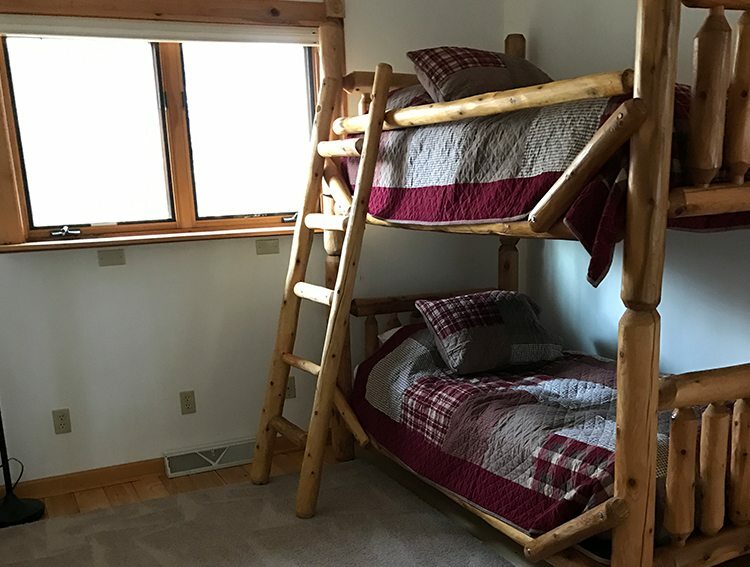 The second upstairs bedroom has a set of pine log bunk beds ideal for children. 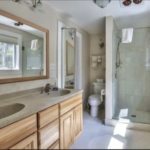 Both bathrooms have been recently remodeled. 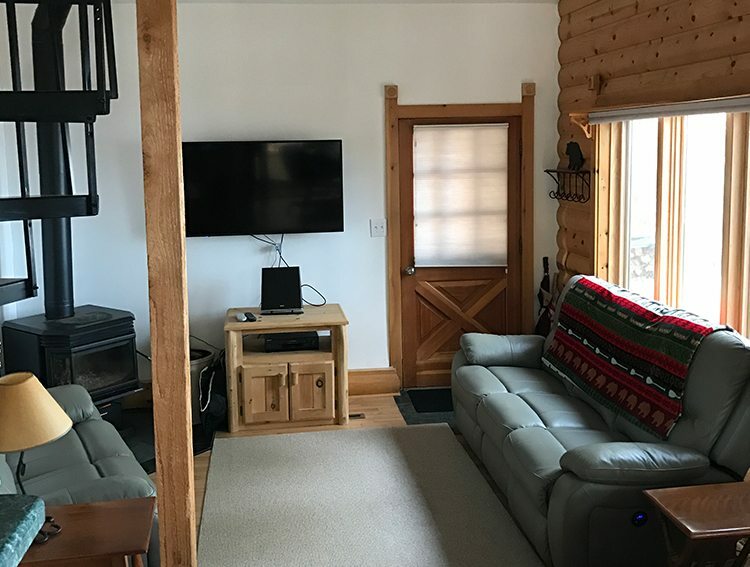 While spending time at the lake, guests can enjoy two kayaks, a canoe or 14’ aluminum boat (with motor and pontoon rentals available upon request). Take a trip around the 750 acre lake while observing all of the wildlife that the Great North has to offer. Eagles, loons, and deer are regular visitors. If fishing interests you, Pickerel Lake is a fisherman’s paradise. You are able to fish right from the pier for northern, musky, walleye and panfish. 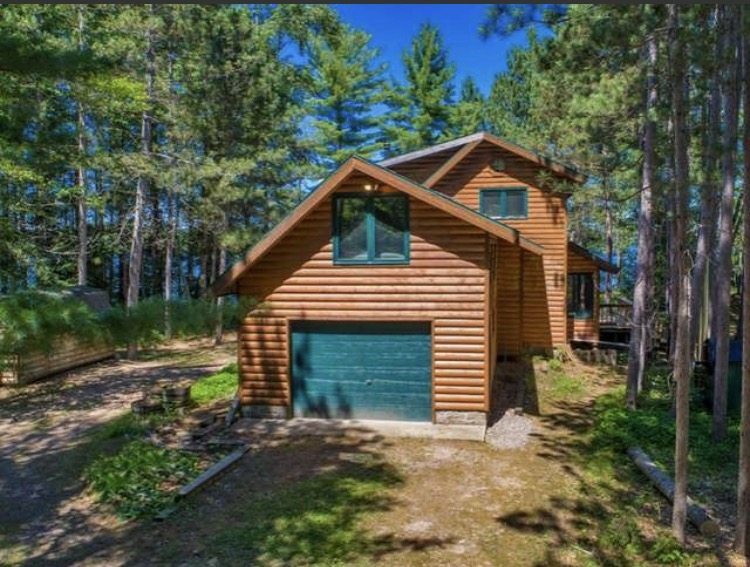 Lakeside Pines is a location that can be enjoyed year round. Launch your boat right down the road at the boat launch. 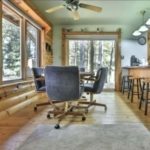 Guests have the ability to bike, hike, fish, swim, tube, water ski or snowmobile right outside the back door. 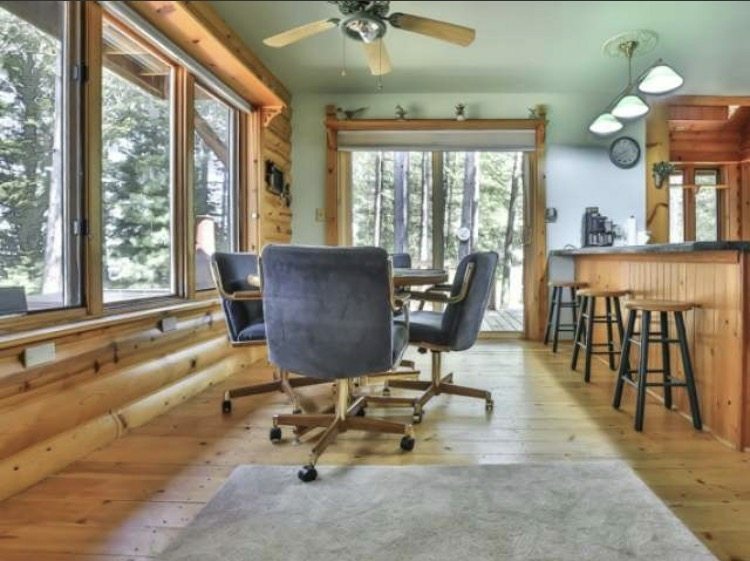 The home equips you with everything you need to make lasting memories at the lake. 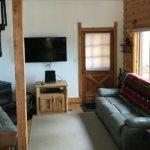 Laundry room with washer/dryer, dishwasher, Wi-Fi, charcoal grill, 2 kayaks, canoe, 14’ aluminum boat, lakeside campfire pit, romantic lakeside balcony and deck and 16.5’ aluminum boat (motor, 16.5’ fishing boat and pontoons available).